Explanation: Findings of ancient martian microbial fossils in meteorites and liquid water related features on Mars' surface are currently controversial issues. But one thing long established by space-based observations of the Red Planet is the presence of volcanos, as Mars supports some of the largest volcanos in the solar system. This synthetic color picture recorded in March by the Mars Global Surveyor spacecraft shows two of them, Ceraunius Tholus (leftmost) and Uranius Tholus. 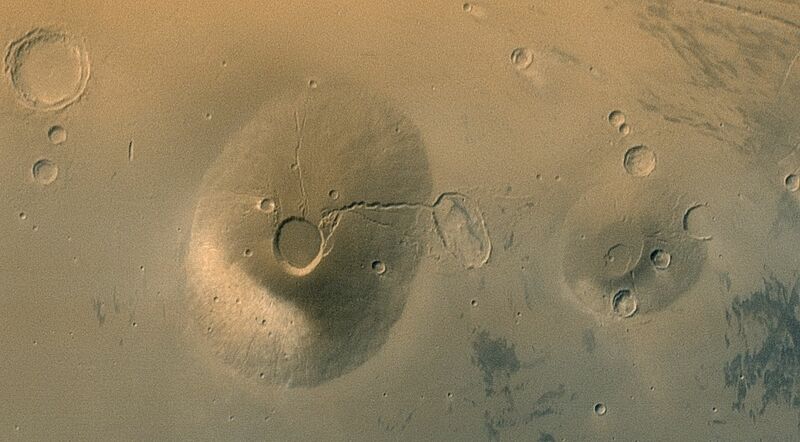 Found north of the Tharsis region of truly large martian volcanos, these are actually two relatively small volcanos, Ceraunius Tholus being only about the size of the Big Island of Hawaii on planet Earth. 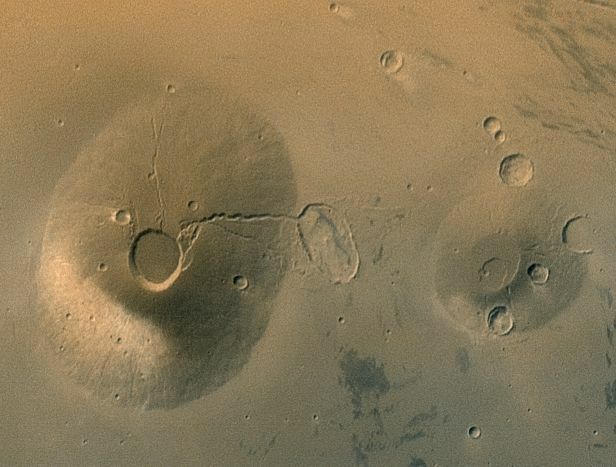 Impact craters which overlay the volcanic martian terrain indicate that these volcanos are themselves ancient and inactive. North is to the right and the scene is illuminated by sunlight from the top left. A light region of dust deposited by recent global dust storms lies on the lower left flank of Ceraunius Tholus, whose summit crater is about 25 kilometers across.